Maya may be big in stature, but what patients notice most are the enormous size of her heart and the gentleness of her soul. 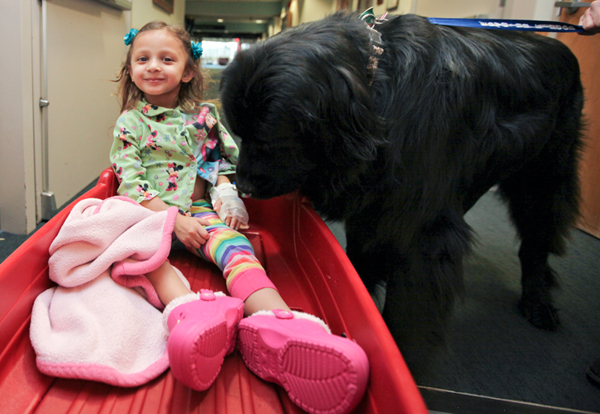 The 130-lb, 2-year-old Newfoundland is one of the newest graduates of Akron Children’s Doggie Brigade program. Her handler, Shawn Lyden, says he’s always admired the work of the Doggie Brigade over the years and knew when Maya was a pup that she would be a great addition to the team. While Lyden spends his Saturday mornings making patient rounds with Maya at the hospital, he spends his weekdays focusing on the business side of healthcare as executive vice president of Akron Children’s. On a recent dreary Saturday, 9-year-old Ethan Swanger, of New Philadelphia, beamed as Maya lumbered in. Ethan has a growing collection of Doggie Brigade cards and keeps them in a special scrapbook. 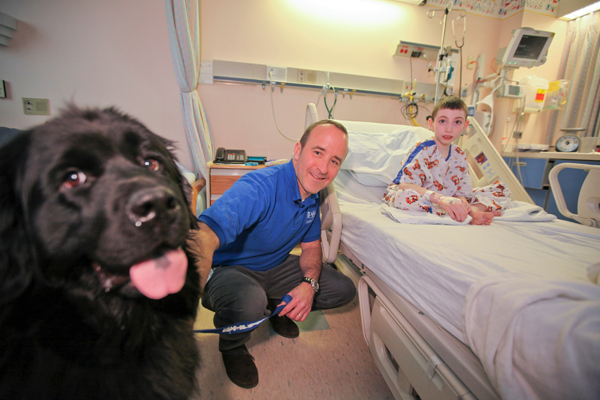 He comes to the hospital every week for therapy and looks forward to seeing more of the dogs. In fact, he’s on a waiting list for a service dog. He and his mom, Cookie Swanger, can’t wait until he has a furry friend to call his own. Cookie said Maya was just what the doctor ordered. Lyden says he’s amazed at the connection he’s already forged with patient families like Ethan’s while he’s doing his rounds. One of his first visits with Maya on the inpatient floor was especially moving. I was looking for photos of Newfoundland Service Dogs….and BINGO, stumbled upon your article. Way to go, Maya! My Newfoundland Service Dog BUBBLES is my best friend and constant companion. She handles Migraine, Stroke, Disorientation, Vertigo and Vision Loss episodes due to Ocular Migraine Strokes – so as I rescued her, she now rescues me. It’s a wonderful life, because even with the constant daily pain, the company of animals is your very best therapy clinic and the ultimate mentorship. We are truly blessed to have each other. God bless you Maya for all that you do for the children and everyone that you come into contact with each day. Val Frost and Bubbles, Ottawa, Ontario, CANADA.